Fabiola Valeska: "For you I brought a flower, I'll leave it here under an overcast sky..."
"For you I brought a flower, I'll leave it here under an overcast sky..."
yet when I started this painting, it had a more optimistic background of vibrant blues for the sky, it was a much larger sky. The little girl was a reference, torn from a magazine that an elderly friend had kept, probably from the 1960's. Yet the composition changed drastically, my mother was diagnosed with Multiple Myeloma. 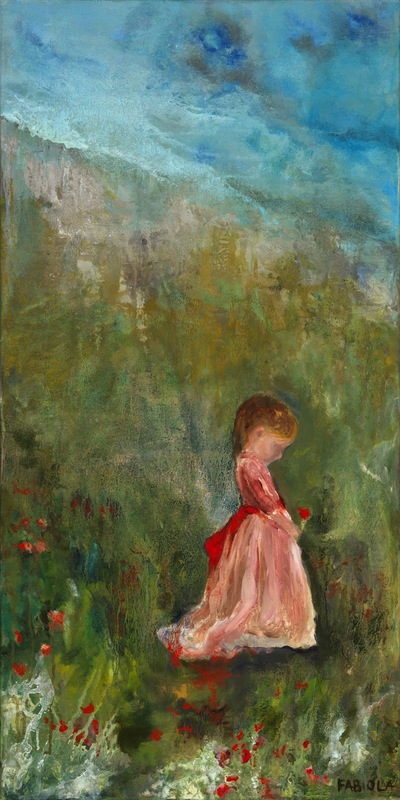 yet her expression may be felt as she looks at the flower in her hand, her aching pink dress. This portrait of a girl with a bleeding dress. Hence the flower garden around her.